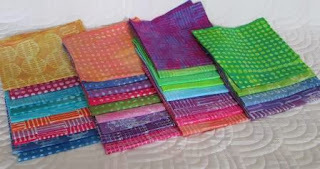 I have picked out my fabric for the Bonnie Hunter Celtic Solstice Mystery Quilt. I have done the last two as mystery's and I did the Roll Roll Cotton Ball after I found them all over the internet over Christmas 2010. If you do not know about the mystery go check it out. I have a few friends and family that are also doing the mystery with me. I think I may have my mom hooked too. She will be a few days behind as she is not home to pick out fabric, but she will catch up by step 2. My fabric is all Batik. Some are hand made soy wax batiks, like the top pink fabric. I hope the orange and pink are not to close together. I may pull a pink with orange one yet. I have also thought it would be cool with Black instead of the light neutrals. I will think about it over night. I did not make a post about the soy wax I made this Sept. 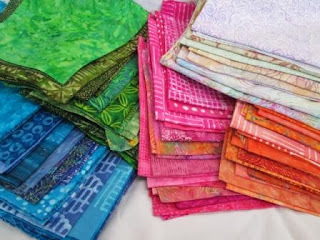 Here is my stash of soy wax batiks. Not all will be used in the mystery. But some will. Like the Greens, Blue, Pink and Orange. 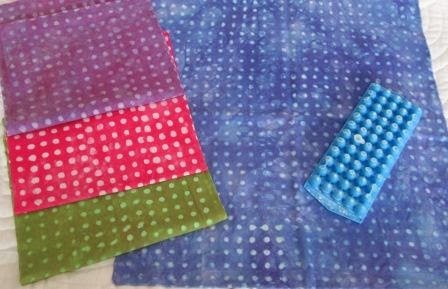 Here is the set of dots made with a mini Ice cube tray. I love these little uneven dots. I love using the old metal potato mashers. They hold the heat so well and the wax moves nicely into the fabric. 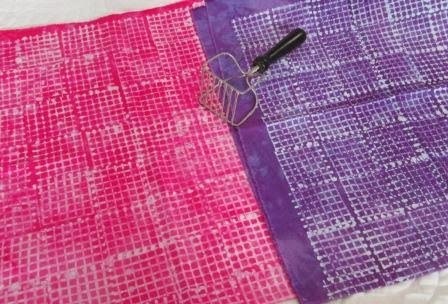 The best part of soy wax Batik is I can wash out the wax with hot water and soap. This is so much easer that the bees wax or other waxes. The other kinds of wax need heat and ironing and solvents to remove the wax. Not soy wax. 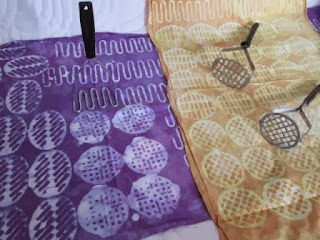 I may never do the other wax batiks again. 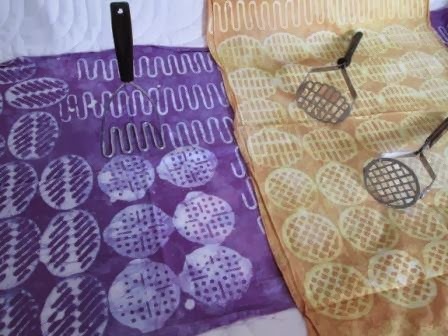 More and different potato mashers. 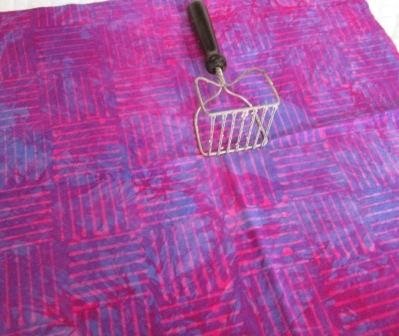 This fabric was a pink dyed fabric that I used soy wax on and then dyed blue to get a purple. The pink remains pink were the wax was. Love this little basket weave pattern. Well back to work so I can start the mystery on Friday morning with every one else. 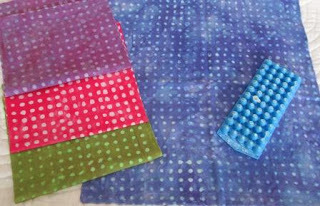 Love your fabrics...looking forward to seeing your version unfold. It's all vibrant and lovely. Can't wait to see what you will make. I especially love your waxed and dyed fabrics. You are multitalented!